This mysterious Naxi citadel hides deep in the green Jinsha River Valley northeast of the Jade Dragon Snow Mountain. 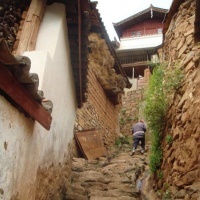 Just like the Inca city of Machu Picchu, Baoshan is also a stone city (properly speaking, it is a small stone village). The village is surrounded by cliffs on four sides with the Jinsha River flowing below and a small path leading to the outside world, one meter wide, creeps along the edge of the village. The people here use stones to build every thing as they can include their houses, desks, tables, beds, pillows, water vats, cisterns, and kitchen ranges. All these stone objects are polished smoothly. 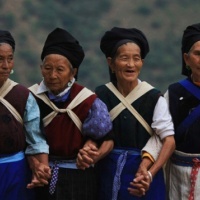 They have recorded the Naxi people's life for centuries. The most wonderful thing in the village is the independent aqueducts/irrigation system. The villagers use them for each track of field, but without any affection on those of others'. 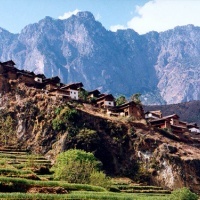 Baoshan Stone City (or Baoshan Stone Village) lies at an elevation of 4,600m and in a section of the beautiful Tiger Leaping Gorge, about 110 km from Lijiang Old Town. If you want to see the picturesque scenery and learn about the architecture of Naxi people, the old Naxi traditions, the mystic Naxi civilization, then you couldn't have found a better place than this site! 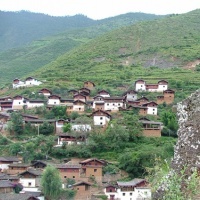 Design and incorporate the Baoshan Stone City into your Yunnan tour here!